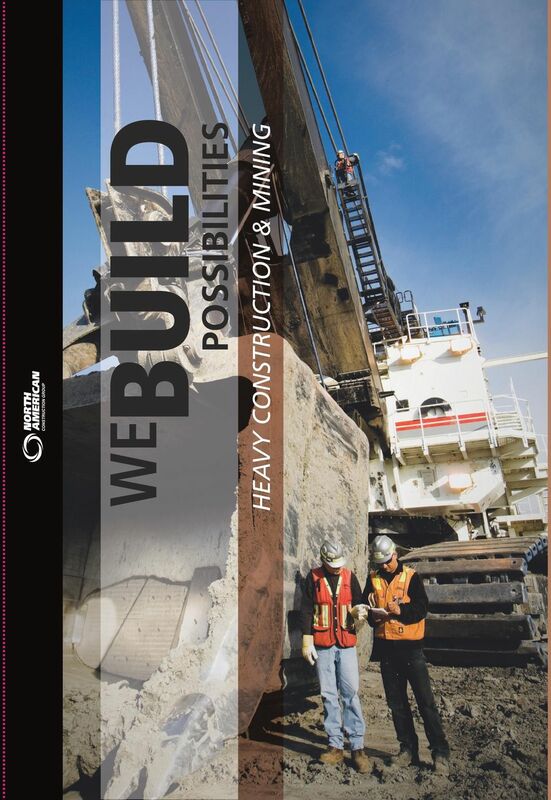 Download "HEAVY CONSTRUCTION & MINING"
2 Photo top: NACG currently owns and operates two Hitachi EX8000 hydraulic shovels in the Alberta oil sands. With its 85 ton capacity bucket, these shovels have the ability to load a 320 ton haul truck in just 4 passes. 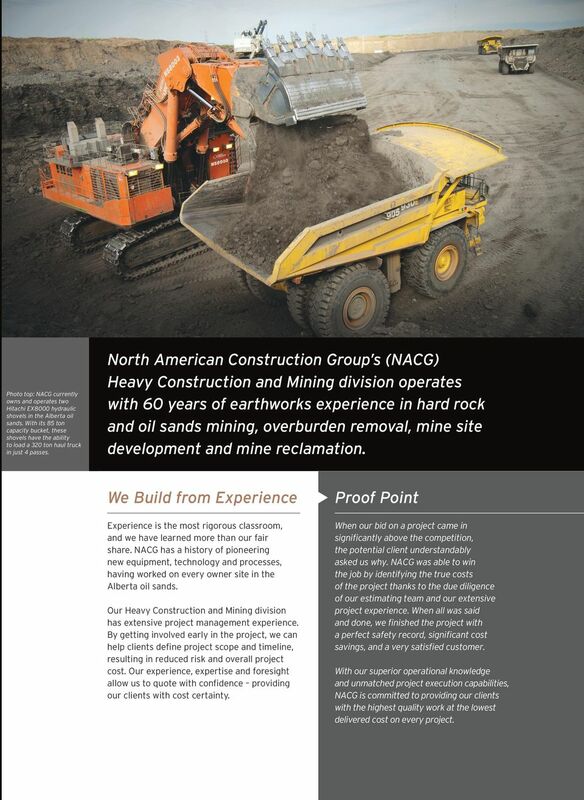 North American Construction Group s (NACG) Heavy Construction and Mining division operates with 60 years of earthworks experience in hard rock and oil sands mining, overburden removal, mine site development and mine reclamation. We Build from Experience Proof Point Experience is the most rigorous classroom, and we have learned more than our fair share. NACG has a history of pioneering new equipment, technology and processes, having worked on every owner site in the Alberta oil sands. When our bid on a project came in significantly above the competition, the potential client understandably asked us why. NACG was able to win the job by identifying the true costs of the project thanks to the due diligence of our estimating team and our extensive project experience. When all was said and done, we finished the project with a perfect safety record, significant cost savings, and a very satisfied customer. 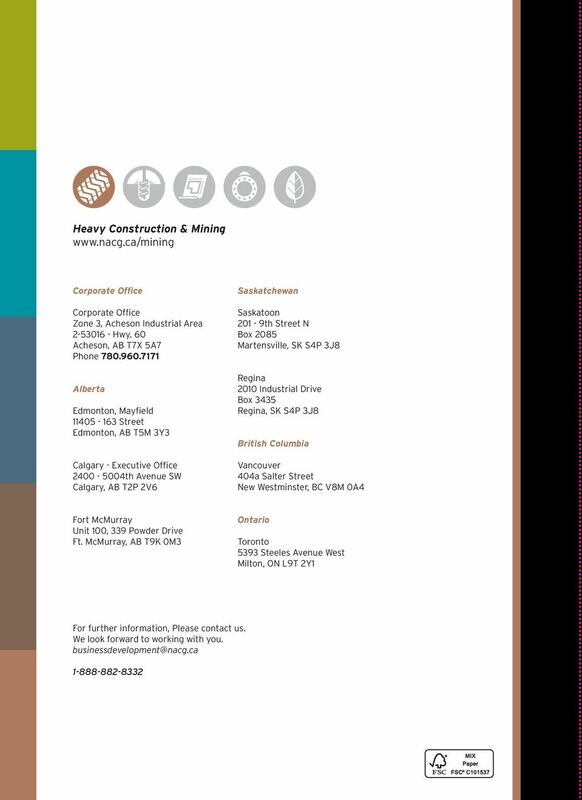 Our Heavy Construction and Mining division has extensive project management experience. By getting involved early in the project, we can help clients define project scope and timeline, resulting in reduced risk and overall project cost. Our experience, expertise and foresight allow us to quote with confidence providing our clients with cost certainty. With our superior operational knowledge and unmatched project execution capabilities, NACG is committed to providing our clients with the highest quality work at the lowest delivered cost on every project. 3 Where We Build, Everyone Gets Home Safe Safety is top priority at NACG, and a strong workplace safety performance record proves it. At NACG, we are committed to getting everyone home safe, every day. As part of our commitment to continually improve safety and maintain our position as a safety-first company, NACG has implemented the following reporting systems and processes: CSA Z HSE Management System Daily Pre-job Safety Instruction (PSI) reporting High quality Field Level Risk Assessment s (FLRA s) Hazard identification and control measures Standardized incident reporting and management processes Green Hand Process for new workers Industry-leading Equipment Operator Training program. Photo top: High quality FLRA cards are used on every jobsite to identify and mitigate workplace hazards. 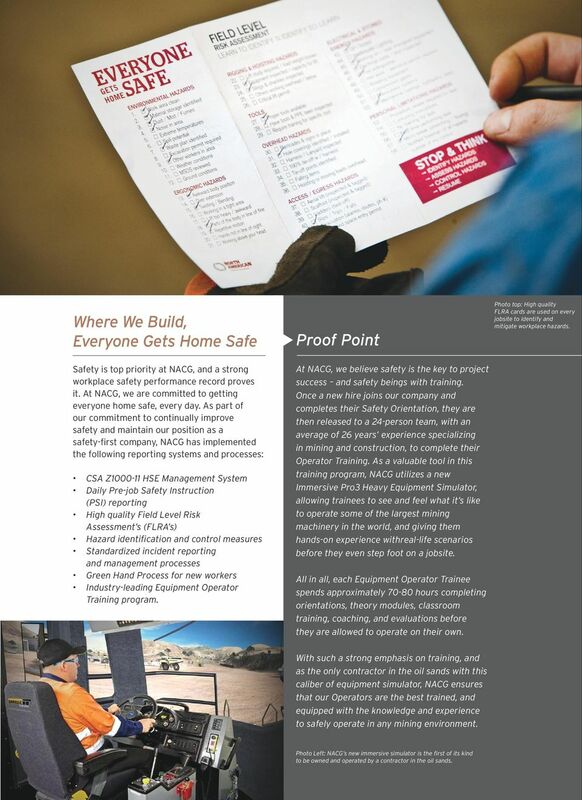 Proof Point At NACG, we believe safety is the key to project success and safety beings with training. Once a new hire joins our company and completes their Safety Orientation, they are then released to a 24-person team, with an average of 26 years experience specializing in mining and construction, to complete their Operator Training. As a valuable tool in this training program, NACG utilizes a new Immersive Pro3 Heavy Equipment Simulator, allowing trainees to see and feel what it s like to operate some of the largest mining machinery in the world, and giving them hands-on experience withreal-life scenarios before they even step foot on a jobsite. All in all, each Equipment Operator Trainee spends approximately hours completing orientations, theory modules, classroom training, coaching, and evaluations before they are allowed to operate on their own. With such a strong emphasis on training, and as the only contractor in the oil sands with this caliber of equipment simulator, NACG ensures that our Operators are the best trained, and equipped with the knowledge and experience to safely operate in any mining environment. Photo Left: NACG s new immersive simulator is the first of its kind to be owned and operated by a contractor in the oil sands. 4 We Build with a Customized Equipment Fleet Photo top/right: NACG s Bucyrus 495-HF shovels are able to load a 400 ton haul truck in just 4 passes. With the largest independently owned equipment fleet in Western Canada, NACG is able to choose the right equipment for the right project, ensuring timely and cost effective operations. In addition to having the most diverse fleet, it s also the best managed. NACG s intensive training programs produce the most qualified managers, operators and maintenance personnel in the industry. Innovative technology and cutting-edge fleet management systems enable NACG to deliver significant productivity gains. Our clients save money every day because we move more earth, more quickly. 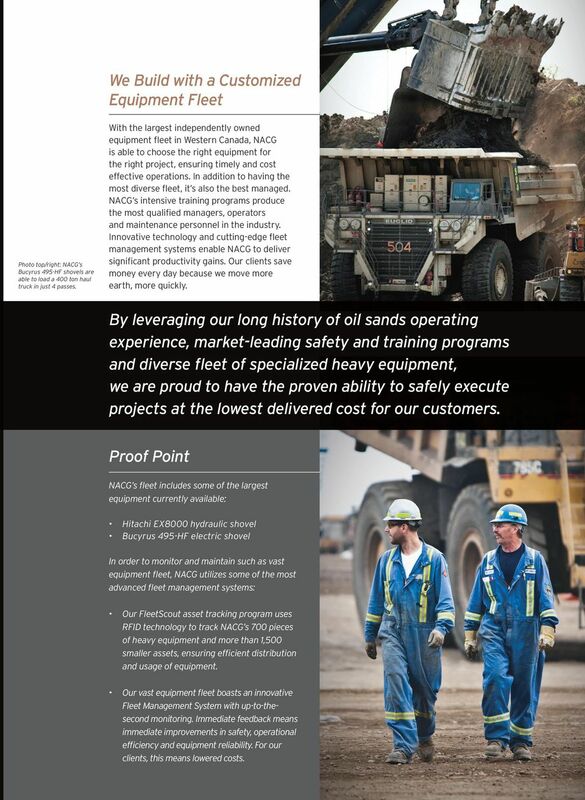 By leveraging our long history of oil sands operating experience, market-leading safety and training programs and diverse fleet of specialized heavy equipment, we are proud to have the proven ability to safely execute projects at the lowest delivered cost for our customers. Proof Point NACG s fleet includes some of the largest equipment currently available: Hitachi EX8000 hydraulic shovel Bucyrus 495-HF electric shovel In order to monitor and maintain such as vast equipment fleet, NACG utilizes some of the most advanced fleet management systems: Our FleetScout asset tracking program uses RFID technology to track NACG s 700 pieces of heavy equipment and more than 1,500 smaller assets, ensuring efficient distribution and usage of equipment. Our vast equipment fleet boasts an innovative Fleet Management System with up-to-thesecond monitoring. Immediate feedback means immediate improvements in safety, operational efficiency and equipment reliability. For our clients, this means lowered costs. 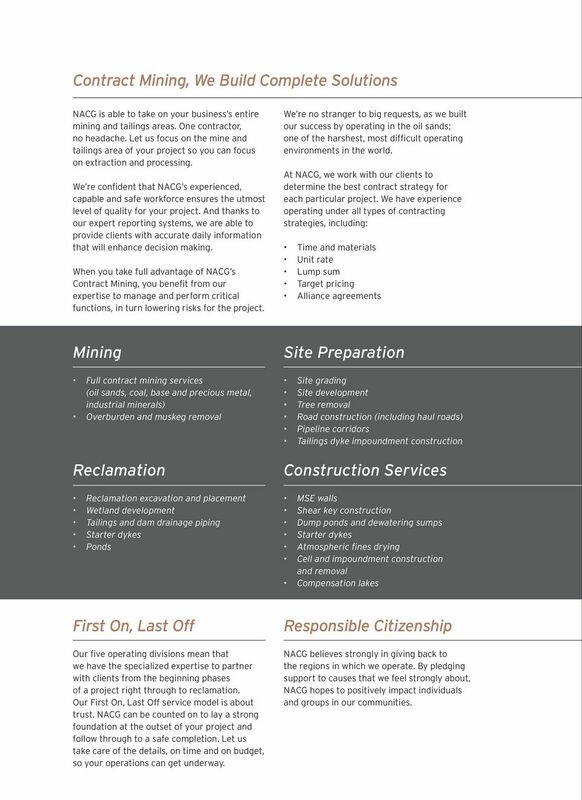 5 Contract Mining, We Build Complete Solutions NACG is able to take on your business s entire mining and tailings areas. One contractor, no headache. Let us focus on the mine and tailings area of your project so you can focus on extraction and processing. We re confident that NACG s experienced, capable and safe workforce ensures the utmost level of quality for your project. And thanks to our expert reporting systems, we are able to provide clients with accurate daily information that will enhance decision making. When you take full advantage of NACG s Contract Mining, you benefit from our expertise to manage and perform critical functions, in turn lowering risks for the project. We re no stranger to big requests, as we built our success by operating in the oil sands; one of the harshest, most difficult operating environments in the world. At NACG, we work with our clients to determine the best contract strategy for each particular project. We have experience operating under all types of contracting strategies, including: Time and materials Unit rate Lump sum Target pricing Alliance agreements Mining Full contract mining services (oil sands, coal, base and precious metal, industrial minerals) Overburden and muskeg removal Reclamation Reclamation excavation and placement Wetland development Tailings and dam drainage piping Starter dykes Ponds Site Preparation Site grading Site development Tree removal Road construction (including haul roads) Pipeline corridors Tailings dyke impoundment construction Construction Services MSE walls Shear key construction Dump ponds and dewatering sumps Starter dykes Atmospheric fines drying Cell and impoundment construction and removal Compensation lakes First On, Last Off Our five operating divisions mean that we have the specialized expertise to partner with clients from the beginning phases of a project right through to reclamation. Our First On, Last Off service model is about trust. NACG can be counted on to lay a strong foundation at the outset of your project and follow through to a safe completion. Let us take care of the details, on time and on budget, so your operations can get underway. Responsible Citizenship NACG believes strongly in giving back to the regions in which we operate. By pledging support to causes that we feel strongly about, NACG hopes to positively impact individuals and groups in our communities. Make a FIRST Impression... Not a LAST! Memberships. W.F. Welding & Overhead Cranes Ltd. Since 1986. W.F. Welding & Overhead Cranes. 1-200 Ton Overhead Cranes. Jib Cranes. INTRODUCTION. Axis Insurance Managers specializes in structuring bespoke insurance solutions for the Oil & Gas Contracting Industry. IHS OPERATIONAL EXCELLENCE & RISK MANAGEMENT Process Safety Management Training Leverage state-of-the-art resources and practical knowhow to learn about proven management system concepts and techniques. JLT Mining. The Canadian economy is, in part, driven by a robust and sophisticated Mining Industry. Canadian Natural Resources Limited Suite 2100, 855 2nd Street SW, Calgary, Alberta, T2P 4J8 T 403.517.6700 F 403.514.7677 www.cnrl. Building Futures Scholarship Application Form 2015. Thank you for your interest In the Building Futures Scholarship Program.